Navy Veterans who meet the below criteria, and enlist into their previous ratings, usually enlist in the grade they held at the time of discharge (up to E-6). Those who must enlist in a different rating (PRISE III) program enlist in the grade of E-3, except for AECF, CTI(N) or Nuclear Program, who enlist in the grade of E-4 (if E-4 or above was held during the previous enlistment). E-3 (with proof of passing E-4 advancement exam): Must have 5 years or less of total active federal service, and no more than 6 years of broken service. E-3 (with no proof of passing E-4 advancement exam): Must have 2 years or less of total active federal service, and no more than 6 years of broken service. E-4: Must have 6 years or less of total active federal service, and no more than 5 years of broken service. E-5: Must have 8 years or less of prior service, and no more than 5 years of broken service. E-6: Must have 12 years or less of total active federal service, and no more than 3 Years Broken Service. In addition to the above qualifications, Navy Veterans must be able to meet the service obligation (term of enlistment) without exceeding the HYT for the grade. If the Veteran holds a skill that is directly convertible to a Navy Rating, they are usually enlisted at one paygrade lower than they held at the time of discharge, but not lower than E-3. 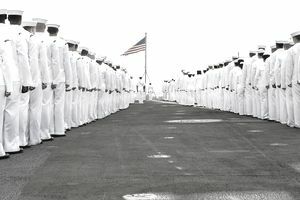 If the veteran does not have a skill directly convertible to a Navy rating, they enlist at the grade of E-3, regardless of previously held rank, in most cases (there are a few exceptions). E-1 through E-3: Must have 6 years or less of prior service, and no more than 5 Years Broken Service. E-4: Must have 6 years or less of prior service, and no more than 3 Years Broken Service. E-5: Must have 8 years or less of prior service, and no more than 3 Years Broken Service. E-6: Must have 12 years or less of prior service, and no more than 3 Years Broken Service. In addition to the above criteria, all prior service must be able to complete 20 years of service by age 55. No waivers are authorized.